« September is National Sewing Month! I love teaching kids to sew. Once they start on their creative sewing journey a world of opportunities seem to open up to them. Suddenly the teddy bear that has a torn arm gets fixed and buttons get resewn on a shirt. School projects that they stitch in class get wrapped for a mom or grandmother and other projects are planned and stitched with love. And once they start sewing and have mastered basic sewing skills I introduce them to the wonderful ways that they can make a difference in their own communities. Sometime during the fall, I talk to my students about stitching for their communities. Together we choose a charity for the year and my kids use some of the classes to complete projects for distribution to that charity. Even my brand new sewers with just with the basics of sewing can take part in stitching for many of the service organizations in our community and the people that they serve. There are so many opportunities to give back and give thanks and all my kids love these service projects. One of the service projects that we sewed for was for A. I. Dupont Hospital in Wilmington Delaware. All my fall classes sewed pillowcases for the hospital and each pillowcase had a hand written note attached. One of the moms worked at A.I.Dupont and she was able to take the pillowcases and give one to every patient that had to stay in the hospital over Christmas that year. What a beautiful day it was to learn that the 50 pillowcases that we stitched brought so much joy to the kids in the hospital. 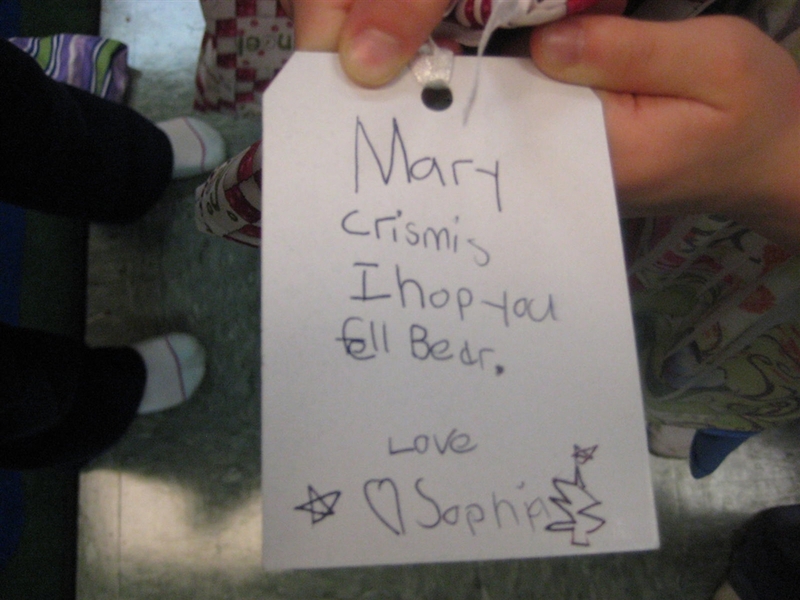 And they LOVED the handmade tags that were attached to each pillowcase. I was a proud sewing teacher! Well after that community service was finished, months later the pillowcases would make another appearance at A.I. Dupont hospital. Allison, daughter of the mom that distributed the pillowcases at Christmas, decided to organize another group of girls, teach them to make the pillowcases, and send them to the hospital to earn her Gold Award in Scouting. Once again, as her sponsor I was beaming with pride not only because of the pillowcases but also because she was passing on her sewing skills to a new generation of sewers. Don’t you just love it? Another great service project that we stitched was pillows for the veterans living on the campus of the VA Hospital in Elsmere Delaware. My fabric rep had lots of fleece samples that he donated for our project. The fleece was soft, washable, and perfect for pillows made to make wheelchairs and hospital beds more comfortable. 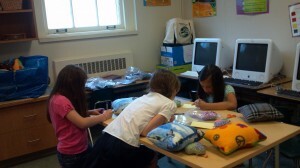 We made 50 pillows in our classes and we brought sewing machines to show them how we made them and to take requests. A small group of girls, parents, and my husband who is a team leader of the Veterans Center in Sussex County Delaware drove to the VA Hospital one Sunday in January. At first there were only a handful of curious vets pushing their wheelchairs into the recreation room to see us set up our presentation and curious about our bags of brightly colored pillows. We introduced ourselves, gave a small presentation, and then several of the girls sat down at the machines to stitch some pillows I had precut for the demonstration. Our initial group of veterans quickly chose their favorites and sped off to their rooms to put them away. As if by magic wheelchairs of other vets started to flow into the recreation room. Soon the pillows were flying off the tables and there were lines of vets waiting to get a customized pillow. The girls relaxed and started conversations with the patients and soon the room was full of stories about the wars that they fought, their families, and their lives as a soldier. Pictures were taken, friendships were started, and a sense of gratitude was felt by all the girls as they realized the bravery of all these men and women. It was a powerful day for all of us and an experience never to be forgotten! While most of these girls and boys are five years old (yes, I do start teaching them at 5 in my classes)and up, I have worked with the preschool kids on several community service projects. For these service projects I like to sew for places like the Humane Society, Animal friends or the SPCA. 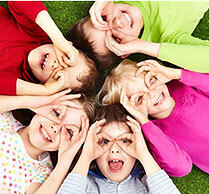 The little ones can relate to the animals and they are full of stories of their own pets. A few years back at Tower Hill School in Wilmington Delaware, all the preschool classes got a chance to practice hand stitching by making kitty toys for the cats at the Delaware Humane Society. 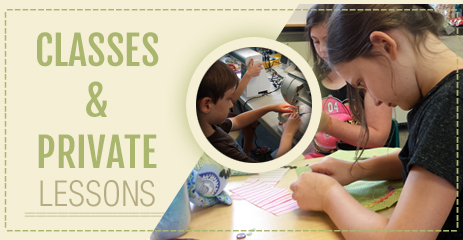 Boys and girls alike tried their best to master the running stitch and the overcast stitch. These are just examples of the many service projects available for kids or adults to pursue within their own communities. What kinds of other projects would be fun to stitch for an organization? Better yet, what new projects could you come up with that might help a group in need? Get involved and be a volunteer. What better way to pay it forward and make this place a better place! Just get stitching….